Living cells exist in a dynamic physiological environment. They are subject to a wide range of mechanical stimuli such as stretch and compression. Uniform Load: Every cell is subjected to nearly uniform strain along the stretch axis (<5% variability). In the non-axial direction, the secondary load is much weaker. The high-precision, high-torque stepping motor in the stretch unit enables stable motion at a range of speeds, from extremely low velocity to high velocity. This motion stability, combined with the superior characteristics of the silicone film chamber, produces mechanical stretching that is highly reproducible. The system can be configured for eight different settings for the stretch ratio — the degree of stretch desired — and eight for the repetition frequency of the stretch movement. There are 64 possible stretching patterns in all. Specially developed silicone film chamber facilitates a variety of lab analysis techniques, including cell fixation and fluorescent imaging. Extracellular matrix coatings applied to the stretch chamber promote cell adhesion and facilitate cell culture. The adhered cells are then stretched and compressed in culture. Versions of the system that mount on microscope stages enable real-time observation of the changes that the cells manifest in response to these applied stress loads. 1. Cells are seeded onto a stretch chamber pre-treated with an extracellular matrix coating. 2. Cells adhere to the stretch chamber. 3. Stretching begins. 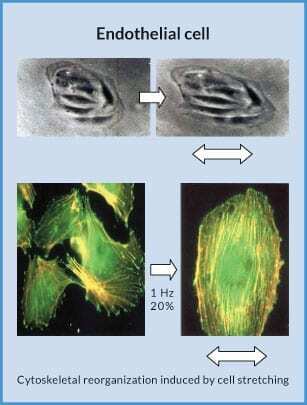 Cells are stretched as specified by the selected stretch pattern. 5. Cells are harvested/treated in accordance with the objectives of the experiment. Note: Supported applications vary, depending on the instrument employed.